Environmental education is a comprehensive process that more than providing information about the environment and its problems, intends to create processes of reflection about how it is that our habits and daily actions have a positive or negative impact on the environment, resulting in assuming responsibility and consequent actions. It is a lifelong process, since we live in a world in constant change and it is necessary to begin this process from an early age in order to make it part of the daily life of each individual. For children it is recommended that environmental education processes focus on awareness of nature through real-life experiences in natural areas that make them feel part of the environment in which they develop, creating empathy with the living beings that surround them and awakening the desire to preserve them. However, it has become necessary for the process of interaction with nature to be controlled, so that we do not jeopardize the habitat or the people participating in the experience, especially when it comes to children. To this end, aquariums, dolphinariums or habitats to swim with dolphins in Mexico, zoos and nurseries, are educational tools that provide us with these experiences in a safe manner and provide a valuable cultural heritage since they also invest a great amount of resources in research efforts that would otherwise be very difficult to accomplish. 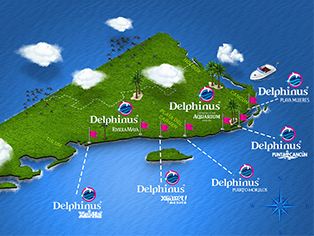 In Delphinus, we have a robust environmental education program addressed to primary education students, which is based on tenets and ideology related not only to environmental education but also to human development and awakening the spirit of commitment of students to the preservation of marine life. Make children aware of environmental problems and be sensitive to them. Promote interest in participation and enhancement of the environment. Build the capacity in children to learn about the environment around them. Increase their knowledge of their immediate environment. It is the responsibility of both schools and parents to foster children’s education by helping them understand the environment and conducting activities relating to Energy, Landscape, Air, Water and Wildlife. It is necessary that environmental education becomes a horizontal empowerment process that takes into account the fact that children are persons with knowledge and experiences of their own, with the ability to respond to their own actions, i.e., bear the consequences of their acts and amend their actions, even from a very early age. This brings us to participatory processes, adapted to each age group and according to their group context. In this regard, within the Delphinus Educational Visits Program, the environmental educator must previously visit students in their schools, to understand the group context in advance and be able to adapt their visit to the dolphinariums and adapt their swim with dolphins in Mexico to their specific needs.